OS grid reference SD 740 745. The massive bulk of the Yorkshire peak Ingleborough mountain called ‘The Mountain of Fire’ is 2,372 feet high (a few maps call it a hill!). It is some 4 miles to the north-east of the town of Ingleton, and is best reached from the B6255 Ingleton to Hawes Road and then via the various footpaths running east up to the summit on which there is an Iron-Age hillfort and, also the remains of what may be a Roman encamp-ment? Down on the lower slopes of the mountain are the famous White Scar Caves and to the east lies the equally famous pot-hole of Gaping Ghyll. 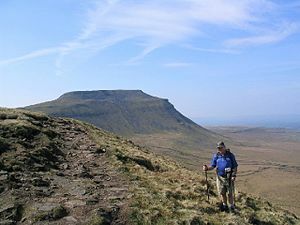 Ingleborough’s flat summit is topped by a hillfort that dates back to the Iron-Age when the Brigantes tribe first settled there. The fort or settlement covers 15 acres (61,000 metres) and its defensive walls, now much robbed away, can still be seen around the edges of the windswept summit. These millstone grit ramparts cover 3,000 feet in circumference, some of which are made up of the natural rock edge which would have been quite helpful at the time as a defense. There are openings at the north, east and South-western sides of the ramparts. The inner part of the fort has 19 or perhaps 20 hut circles placed at intervals; the hut circles measure between 5 metres and 8 metres in circumference, though some historians call them ring structures without hearths and roofs, which were built by the Brigantes, a tribe that covered most of northern England from the west to east coast; they later supported the Roman invasion of the northern Pennines even though they were, at that time themselves under attack from the Roman legions who were spreading out and moving north, west and east. It seems likely that the Iron-Age hillfort was in general use all year round – the climate at that time being much more temperate than it is now, otherwise it would have been virtually impossible to live on the summit during the winter months. The Brigantean queen, Cartimandua, handed the Romans Caractacus, a British chieftain, who had led a guerrila-style revolt against the invading army in AD 51; Cartimandua then married Venutius, a Brigantean chieftain, but the marriage did not last long because in AD 52 they divorced and the queen married Vellocatus (who was then king from AD 52-69); he was Venutius’ own armour-bearer – causing him much displeasure. Civil war then broke out in the northern Pennines and to quell this disorder the Roman governor Quintus Petillius Cerealis (AD 71-74) ordered the IX legion to the area to put down the revolt. The Brigantes were crushed, while Venutius travelled north-east to Richmond where he was eventually defeated by elite Roman troops – it is not known what happened to him after that – more than likely he was killed at Stanwick near Richmond. The date of his death is not known. On the northern and eastern edge of Ingleborough summit are the remains of some walling which some historians considered to have been a Roman military encampment – though there is still much uncertainty about this. The nearest Roman fort is at Bainbridge to the north which was connected by a Roman road from Ingleton to Lancaster via Cam Fell. Ingleton church is built on top of a mound that could have been used to protect the river crossing, but it is not thought to have been inhabited by the Romans and no evidence of any occupation by them exists in the town itself. Later the Anglo Saxons further to the west moved inland and settled in Ingleton and the surrounding settlements. Bentley, John., – A Unique Yorkshire Village – The History of Ingleton, Ingleton Publications,2008. Raistrick, Arthur., – The Pennine Dales, Arrow Books, 1972. With thanks also to ‘The Northern Antiquarian’ (General Archaeology Section). © Ray Spencer, The Journal of Antiquities, 2013. Categories: Hillforts, Ingleborough Hillfort In North Yorkshire | Tags: Ingleborough Hillfort In North Yorkshire | Permalink. Jim Cooper writes that: Recent thinking suggests that the “Iron Age Ingleborough Hill Fort” is no such thing! That it is a “Hill Top Sanctuary” dating to the 2nd millennium BC. (see ‘Rethinking Ingleborough’ Yvonne Luke, Department of Archaeology, York. http://www.hillfortsstudygroup.org.uk/Ingleborough.pdf ).